A NEARLY NORMAL FAMILY first caught my eye because (no surprise here!) the author is Swedish, and I’m always on the lookout for new Scandinavian crime fiction to love. But the more I learned about this book, the more intrigued I became. A NEARLY NORMAL FAMILY isn’t your typical Nordic crime novel: this is not a story about a police officer chasing a killer. 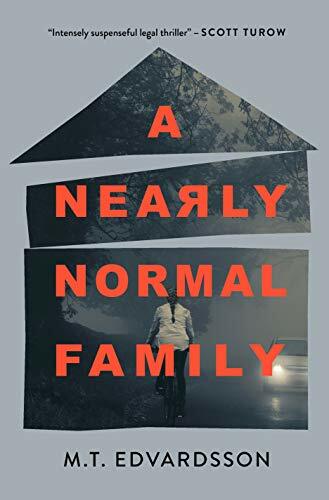 Instead, A NEARLY NORMAL FAMILY is a psychological thriller that takes readers up close and personal with an ordinary family who is thrown into an unthinkable situation when their teenage daughter is accused of murder. How well do you know your family? And how far would you go to protect the ones you love? A NEARLY NORMAL FAMILY sounds right up my alley, and I’m absolutely thrilled to share this preview of the book with CBTB readers. 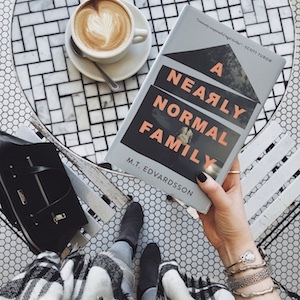 Read on for plot details and an excerpt from A NEARLY NORMAL FAMILY by M.T. Edvardsson! M.T. Edvardsson’s A Nearly Normal Family is a gripping psychological thriller that forces the reader to consider: how far would you go to protect the ones you love? In this twisted narrative of love and murder, a horrific crime makes a seemingly normal family question everything they thought they knew about their life―and each other. The district courthouse is in downtown Lund, kitty-corner from the police building, a stone’s throw from Central Station. Anyone who lives in Lund passes the courthouse regularly, but most go their whole lives without setting foot inside the building. Until very recently, that was true for me as well. Now I’m sitting on a bench outside Courtroom 2, and the monitor in front of me informs me that a trial is under way in a homicide case. My wife is inside, on the other side of the door. Before we walked into the courthouse and went through security, we stopped on the stairs outside and held each other. My wife squeezed my hands so hard they trembled and she told me it is no longer up to us, that the decision is in other hands now. We both know that isn’t entirely true. The loudspeaker crackles, and I am struck by an acute wave of nausea. I hear my name. It’s my turn now. I wobble as I rise from the bench and a security guard opens the door for me. He nods, but his expression doesn’t betray a single thought or emotion. There is no room for that here. Courtroom 2 is larger than I’d expected. My wife is squeezed in among the audience members. She looks tired, exhausted. There are traces of tears on her cheeks. An instant later, I see my daughter. She’s pale and thinner than I remember; her hair looks tangled and wispy, and she looks at me with dull eyes. It takes all my strength not to run over and throw my arms around her and whisper that Dad is here, that I’m not going to let go of her until this is all over. The presiding judge welcomes me, and my immediate impression of him is favorable. He looks alert, yet there is something sensitive about him. He appears to be both sympathetic and authoritative. I don’t think the lay judges are likely to oppose his ruling when it comes. What’s more, I know he, too, is a father. Since I’m a close relative of the defendant, I’m not allowed to take the oath. I know the court must hear my testimony in full knowledge that my daughter is the defendant in this case. But I also know that who I am, and not least my occupation, means that the court will consider what I have to say to be trustworthy. The lead judge gives the defense attorney the floor. I take a deep breath. What I’m about to say will affect so many lives for so many years to come. What I’m about to say might decide everything. I still haven’t decided what I’m going to say. We were a perfectly ordinary family. We had interesting, well-paid jobs and an extensive circle of friends. We kept active in our free time thanks to our interest in sports and culture. On Fridays we ate takeout in front of Idol and dozed off on the sofa before the voting was over. On Saturdays we ate lunch downtown or at a shopping center. We watched handball or went to the movies; we enjoyed a bottle of wine with good friends. We fell asleep each night cuddled close together. Sundays were spent in the forest or at a museum, having long talks on the phone with our parents, or curled up on the sofa with a novel. We often rounded off Sunday evenings sitting up in bed with papers, binders, and computers strewn everywhere, preparing for the upcoming workweek. On Monday nights, my wife went to yoga and on Thursdays I played basketball. We had a mortgage, which we dutifully made payments on; we sorted our trash and used our blinkers and kept to the speed limit and always returned library books on time. This year we took vacation late: early July to mid-August. After several lovely summers in Italy, we had spent the last few years scheduling our international trips in the wintertime so we could spend summers relaxing at home and going on shorter excursions along the coast to visit friends and relatives. This time we also rented a cottage on the island of Orust. Stella spent just about her whole summer working at H&M. She was saving up for a long trip to Asia this winter. I still hope she manages to go. You could say that Ulrika and I rediscovered each other this summer. It sounds like such a cliché, almost too cheesy; no one believes it’s possible to fall in love with your wife all over again after twenty years. As if the years raising a child were merely an aside in our love story. As if this is what we’ve been waiting for. But that’s how it feels, anyway. Kids are a full-time job. When they’re babies you’re waiting for them to become independent, and you spend all your time worrying that they’ll choke on something or fall on their face. Then comes preschool and you worry because they’re out of your sight, because they might fall off a swing set or fail their next check-up. Then they start school and you worry that they won’t fit in, won’t make any friends, and everything is homework and riding lessons, handball and pajama parties. They start high school and there are even more friends, parties and conflicts, talks with tutors, all the chauffeuring around. You worry about drugs and drinking, that they’ll end up in bad company, and the teenage years go by like a soap opera at 190 kilometers per hour. Then suddenly you’re standing there with an adult child and you think you’ll finally get to stop worrying. From A Nearly Normal Family by M.T. Edvardsson. Copyright (c) 2019 by the author and reprinted by permission of Celadon Books, a division of Macmillan Publishing Group, LLC.